Internet of Things pioneer Echelon Corporation (NASDAQ:ELON) is the top U.S.-based provider of smart connected streetlight deployments according to a new global study of the LED and smart street lighting market. The independent study that analyzes and forecasts the market from 2017 through 2027 was just published by Northeast Group, LLC. This report looks at 125 different countries and finds that the number of smart streetlight projects is growing rapidly around the world. Also according to the report, Echelon is the top Western vendor of smart streetlights deployed in the Asia-Pacific region. The study finds that smart street lighting will account for 29% of the $64.2 billion total LED and smart streetlight market by 2027. Municipalities and utilities have embraced the benefits of LED lights, including longer lamp lifetimes, reduced energy consumption and lower maintenance expenses when compared with legacy technologies. Connecting streetlights to make them ‘smart’ can further reduce costs, lower energy usage through intelligent control of brightness and scheduling, and reduce maintenance through actionable status reports on a streetlight’s condition. Smart connected lighting can also provide the foundation for “smart city” applications. “LED streetlights are transforming municipalities across the globe,” said Ben Gardner, President, Northeast Group, LLC. “Adding smart technology to streetlights is increasingly viewed as the first step towards smart cities.” Many cities are deploying smart streetlights with the aim of later adding further applications. Among other advantages, the study found that smart streetlights greatly improve safety conditions in a city by reducing the “down time” of streetlights. “In many cities that are managing rising street crime, this will be a particularly strong benefit,” said Gardner. As a pioneer in the IoT market, Echelon is in a unique position to capitalize on this trend. 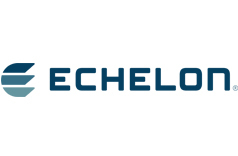 Numerous cities around the globe are deploying Echelon technology in their street light upgrades to achieve greater cost savings and create a network for future smart city enhancements. “This detailed Northeast Group study shows that municipalities around the world are increasingly recognizing the value in adding smart technology to their streetlights, validating our investment in this market,” said Ron Sege, Chairman and Chief Executive Officer, Echelon.